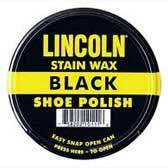 The Lincoln Shoe Polish Company has been making quality leather care products since 1925. They make it their business to use only the finest raw materials from around the world. Lincoln Stain Wax shoe polish is manufactured using a blend of Carnauba and other waxes to treat and waterproof boots and other leather products. Also known as Brazil or palm wax, Carnauba wax comes from carnauba palm leaves, which are beaten to loosen the wax. It’s processed to create a product that gives you a high-gloss finish with improved hardness and durability. You know Lincoln Stain Wax is great, it’s approved for use by the USMC!